We are pleased to offer a rare opportunity to acquire a meticulously-maintained, vintage courtyard building through a condo deconversion sale. Maribel Court is a 34-unit building in Oak Park, a leafy municipality with a quiet suburban feel, yet still directly adjacent to Chicago. The building was completed in 1927 and converted to condominiums in 2004. Maribel Court consists of 3 studios, 28 one-bedroom units and 3 two-bedroom units. There are 28 parking spots on an outdoor lot and a roof antenna lease that runs until 2035. The property is in the Oak Park Arts District, a leafy, walkable neighborhood home to a thriving artistic community as well as a variety of galleries, boutiques and restaurants. 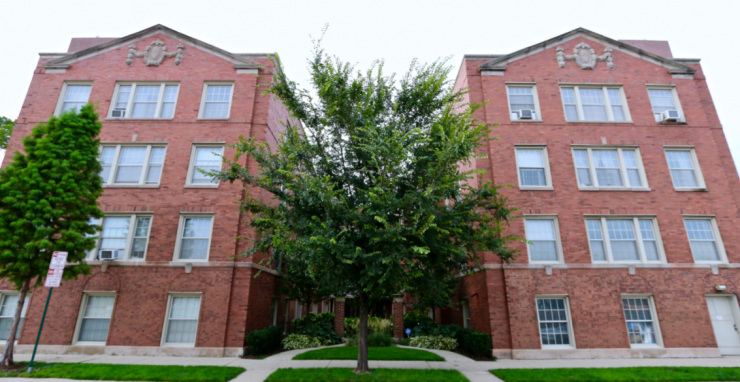 Access to the property is superb: just steps away from the Oak Park Ave CTA Blue Line stop, just off the Eisenhower Expressway (I-290), and 1.5 miles from the Metra’s Oak Park Station. The owners have diligently maintained the property over the years to an uncommonly high standard. Mechanicals have been recently replaced and are on regular maintenance schedules, tuck-pointing was completed in 2017, and a roof resurfacing was completed in 2017. The building has earned preservation accolades from the Village of Oak Park and the overall pride of ownership is evident immediately upon viewing the property.